Freddy is nearly ready to release his new album Doublespeak, the follow -up to Things You Never Thought I’d Say. An indie success story, Things resulted in airplay and film and TV placements, most recently on the CW’s Fly Girls, ABC’s Cupid, and ABC Family’s Kyle XY, as well as the hit show Men In Trees, and in the Sony feature film Wieners. Three singles from the album, and an original Christmas song, spun at commercial (Neilsen Reporting) Top 40 and Hot A/C stations across North America. The album was serviced to radio in Canada by Music Media Network and Bryan Farrish Radio Promotion, and in the United States by Bryan Farrish and Evolution promotion. Freddy has been seen and heard in interviews on radio and television across North America. He has performed on live television in Canada and in the United States, including a live interview and performance on Salt Lake City’s ABC 4, to coincide with the placement of Freddy’s song A Moment Away (Patiently Waiting) on ABC’s Men in Trees, starring Anne Heche. He has been featured numerous times on Europe’s largest Top 40 radio station, Big FM, based in Stuttgart, Germany. Each feature has been accompanied by an interview, and a profile on Big FM’s website. To bring the album to a wider audience, Freddy partnered with Coca-Cola and Fresh Tracks Music (now MyTracks) as a featured artist on the MyCoke website. Physical distribution of Things was done through Canada’s venerable Fusion 3, and the album was a featured pick of one of Canada’s largest music retailers, Music World. Freddy’s film and television placements have largely been a result of his work with Los Angeles-based Music Publisher Crucial Music (www.crucialmusic.com). Crucial specializes in placing music in Film, Television, Advertising, Video Games, and Film Trailers, and they have long and strong relationships with all the major studios. Freddy joined the Crucial Family in 2006, and the relationship continues to be fruitful. Tanvi Patel, President/CEO of Crucial said of Freddy: “In addition to being a talented songwriter and vocalist, Freddy is a savvy businessman who understands the business of music, which includes understanding promotion, quality production, publishing, and sales. He just gets it. It’s refreshing to see an artist with depth and talent. Crucial Music is honored to be able to work his music to the film and TV music industry.” Freddy also has cultivated publishing relationships with Audiosparx, Bluescout, ETNC, and J2R Music. Freddy has worked with Judy Stakee of Warner Chappell publishing, one of the world’s leading publishing companies, and part of the Warner Music Group. More recently, Freddy has had the pleasure of working with Bobby Rymer of Nashville’s Writers Den Music Group. In addition to the placements that Freddy’s publishers have found for his music, Freddy has also negotiated directly with television producers and music supervisors, including MTV’s Rodarick Harden, and John Simpson and Noella Choi of TV’s Chris and John to the Rescue. Five of Freddy’s songs are featured in episodes of Chris and John, now available worldwide on DVD, and which is seen in Canada, the United States, and Australia. Freddy’s first development deal was signed with Briton Max Wilson of Pink Scales. Fresh from her work with James Sanger and Keane, Max discovered Freddy and signed him to a production and development deal with Pink Scales, based out of the United Kingdom and France. During his time working with Max, Freddy had the good fortune to meet, and work with, London-based engineer, producer, programmer and DJ Jez Clover (The Animal Farm), and French producer David Coulomiers (Keane, Shaggy, Star Academy). The relationship dissolved amicably in 2005, and Freddy once again took the creative reins of his career, and began work on his latest album, Doublespeak. For this new effort, Freddy has once again teamed up with his friend and producer Craig Poole (Kaskade, Joslyn, David Archuleta, Doug Osmond, Jibe Project, SoVery). Other friends appearing on the album include drummer Joel Stevenett (SheDaisy, JoDee Messina), and guitarist Doug Collins (Sara Evans). Freddy’s Internet presence remains strong. A Google search of Freddy Litwiniuk will bring up over 100,000 results. He has thousands of fans all over the world, as evidenced by his website, iTunes, MySpace, iLike, LastFM, Amie Street, The Sixty-One, Broadjam, Garageband.com, and many other online music stores, sites, and blogs. Doublespeak was chosen as the CD of the day by the influential music blog, Absolute Powerpop. Freddy’s song Apart is 6 all time on Garageband.com’s pop charts, placing him in the elite company of the Falling Wallendas, Geoff Byrd, Randy Coleman and others. Many of Freddy’s songs, including Apart, have been featured as songs of the day or of the week at Garageband.com, and have reached the top of the charts at Broadjam. When not pursuing his artist career, Freddy spends time in Nashville, exploring opportunities as a songwriter and producer, and expanding his catalogue beyond pop music. He is a proud member of the Nashville Songwriters’ Association International (NSAI). He has opportunity to work with some of Nashville’s best producers and songwriters: Jennifer Adan, Sara Beck, Jenn Schott, Aaron Scherz, Jason Lehning, Clint Lagerberg, Brian Maher, Ben Cooper, Tami Hinesh, Brandon Jane, and Bill McDermott. Freddy has been recognized numerous times for the quality of his songwriting, in some of the world’s most prestigious songwriting competitions. Most recently, his song Massive was the only non-Country song chosen as a finalist in the 2008 Country Music Television/Nashville Songwriters Association International Song Contest, and Freddy was featured on the CMT website. Freddy has won prizes in the Billboard Song Contest, the Unisong Song Contest, the Broadjam 6-pack, and the Calgary International Folk Festival Song Contest. He has twice been a semi-finalist in the International Songwriting Competition (2004 and 2005), chosen from tens of thousands of applicants. Freddy has also had songs cut by other artists. 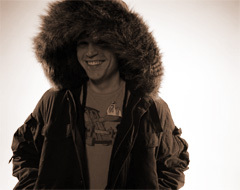 Freddy co-wrote That Girl, featured on the self-titled debut album from Joslyn, best known as the voice of the music of DJ and Dance artist Kaskade (www.myspace.com/JoslynSoVery). Recent cut: Freddy co-wrote I’m Not That Girl with up-and-coming pop-country artist Brinn Black, and the song is the debut single from Brinn’s 2010 EP. Freddy is a member of SOCAN, Canada’s Performing Rights Organization, and he is affiliated with ASCAP in the United States. Freddy is a member of TAXI, the world’s leading independent Artist and Repertoire Company, and he has been profiled numerous times as a featured member, for his successes in music.